Earlier this year we saw something that took us completely by surprise. There was a group of people in wheelchairs hanging themselves from a bridge in Cochabamba, Bolivia. They were protesting for a monthly benefit for people with disabilities of $72. We're a team of filmmakers and journalists who have followed the protest ever since. The group of people with disabilities have now been protesting for over 140 days. They began with a vigil in the main square of Cochabamba and then suspended themselves from the bridge. 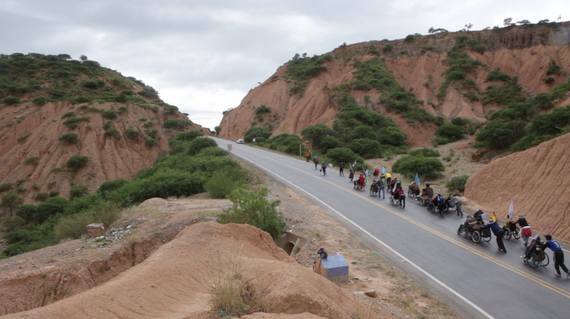 When authorities refused to discuss their requests, they decided to roll and walk 380km across the Andes to speak with President Evo Morales in La Paz. 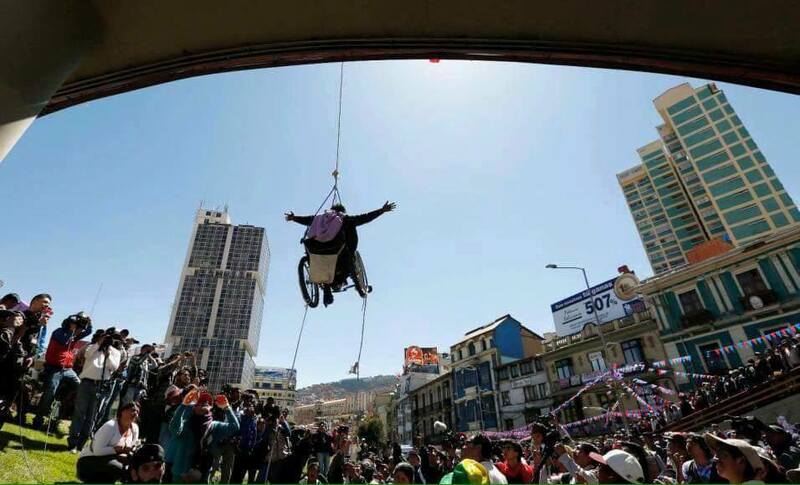 There are about 52,000 people currently registered with a disability in Bolivia. We've been told that 80% of people with disabilities in the country, are illiterate and 60% don't live to the age of 50. 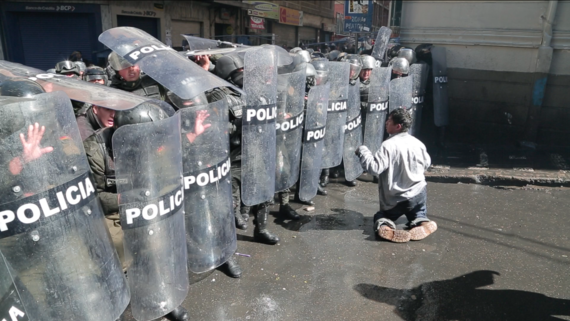 When the protestors arrived in La Paz they were met by police. The government has erected 3m high barricades around Plaza Murillo where the government offices are located, stationed at least three tanks and some 400 police to stop the wheelchair protestors from entering the plaza. They set up camp a block from Plaza Murillo on the streets of La Paz where they have lived in tents for more than a month. 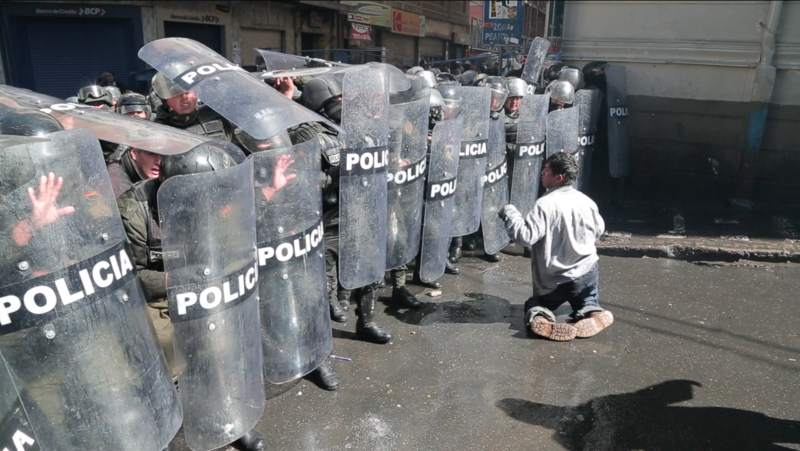 There have been a number of violent confrontations between police and the people with disabilities protesting in La Paz. The police who are equipped with full riot gear, helmets, body armor, full-length shields and batons have used pepper spray and water canons against the protestors. The violence has escalated to the point that on May 25th, the group was violently repressed by more than a hundred anti-riot police. The protestors were thrown from their wheelchairs, had their crutches taken and we witnessed police kicking people in the head after they were pushed to the ground, after this the police used water canons on the wheelchair protestors. The majority of protestors that day were women. Eight protestors were injured and six were detained overnight. The government justifies the violence against the people with disabilities by saying the protestors threw urine and bleach at the police and also used nauseous gas against them. While the protestors where marching and rolling across the Andes, Edgar Romero a member of parliament for the MAS party, stated on public television "We can't increase the benefits for people who are not productive for the country who don't work. We believe the disabled are acting with unreasonable and unjustifiable inflexibility, the state can't give a lot of money to people who don't work or do anything." A leader for people with disabilities, Feliza Ali, replied saying that, "This benefit isn't like a present from a father. This benefit will reduce the inequality gap and help us make decisions for ourselves. If I have the 500Bs, when I travel by bus, rather that crawl along the floor like an animal to reach my seat, I can pay someone to help onto the bus with dignity. This isn't a self-riotous demand; it's the beginning of self-determination. This is the starting point to for us to live with dignity. The time has come to stop the segregation and apartheid that we've been living for generations." As filmmakers we've suffered aggression and intimidation from the government, we've been on the receiving end of police violence and verbal threats, police have stated in front of us that the first chance they get they'll smash our camera, one of our cameras was also stolen. We've been called spies for the CIA trying to destabilize the country. A government group called 'Satucos' has campaign online against us, they've put our photos online with false claims that have instigated online intimidation and indirectly call for aggression against us from the Bolivian public. We are releasing this video to bring the current situation in Bolivia to the attention of the international community, international disability groups, foreign governments and the UN to call the Bolivian Government to bring a stop to this violence and the violation of the human rights of a group of vulnerable protestors. We also call for the Bolivian government to respect the freedom of expression for journalists and filmmakers covering the events as they unfold. You can also tweet Bolivia's President Evo Morales at @evoespueblo and the office of Vice President Alvaro Garcia Linera at @VPEP_Bol to ask them to meet and talk to the protestors. Our team includes a further Bolivian journalist and photographer.